"318 New Iron Railroad Bridge at Portage"
"Photographed by Washburn, Castile, N.Y"
This photograph was taken from the west bank of the Genesee, just south of the bridge. Two of the new iron towers can be seen, resting on stone abutments. A wooden walkway is visible near the base of the bridge. Just beyond the bridge the Genesee tumbles over the Upper Falls. Above the falls, on the east bank, one can see the Genesee Valley Canal and towpath. In the distance, just left of the first tower, one can make out part of the Glen Iris. The image was probably taken shortly after the new bridge was completed. 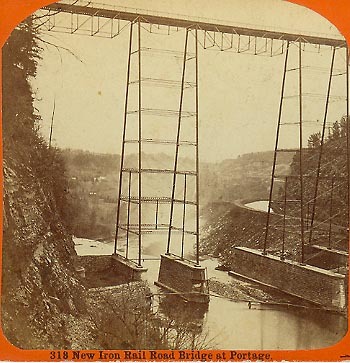 The back of the stereocard states "The Present Iron Bridge 820 feet long and 236 feet high to top of railing, containing 1,315,500 lbs of iron exclusive of track material, was built by the Watson Bridge Co. of Paterson N.J. The first shipment of material was made June 8th 1875, and the Bridge was opened for business 53 days later, on July 31, 1875." You can find an photograph of this bridge under construction, or read more about the Portage Bridges.